Air Force Special Vehicle Maintenance (2T3X2) performs vehicle maintenance activities on military and commercial design refueling and firefighting vehicles and equipment. Activities include inspection, diagnostics, repair, and rebuild of components and assemblies. Determines the overall mechanical condition of vehicles and equipment, corrections of deficiencies required, and effects repair. Systematically analyzes malfunctions by visual and auditory examination or through the use of test equipment. Repairs, adjusts, overhauls or replaces major assemblies or subassemblies such as power and drive trains, electrical, air-conditioning, fuel, emission, brake, steering, pumping, suction and agitator, and traction systems. Removes and disassembles gasoline or diesel engines and components. Repairs components by replacing worn or damaged parts with new or reconditioned parts. Reassembles, adjusts, and tests repaired units for proper operation. Calibrates and adjusts pumps, meters, safety unit proportioning devices, and limiting devices to ensure proper operation. Synchronizes remote or manual electrical and hydraulic controls. Adjusts power boosters, clutches, drive chains, and tension devices. 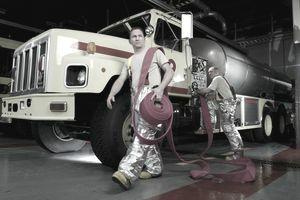 Performs hydrostatic hose testing of refueling vehicle and equipment. Performs preventive and special maintenance, uses technical publications in maintaining vehicles to prescribed manufactures maintenance schedules. Ensures special inspections and maintenance on vehicles are performed correctly such as, corrosion control, winterization, storage and shipment. Properly annotates all maintenance performed on prescribed forms for data collection purposes. Adheres to all established safety policies and standards to include identification, use, and proper procedures for handling or disposal of hazardous waste. Knowledge is mandatory of mechanical theory applying to special purpose vehicles; using lubricants, methods of hoisting and handling heavy mechanisms; using tools; internal combustion engines; electricity and hydraulics. For entry into this specialty, completion of high school with courses in shop mechanics or industrial arts is desirable. 2T332A. Completion of the apprentice special vehicle mechanic (crash or fire vehicles) course. 2T332B. Completion of the apprentice special vehicle mechanic (refueling vehicles) course. AFSC 2T352A/B. Qualification in and possession of AFSC 2T332A/B. Also, experience is mandatory in the functions of inspecting, maintaining or repairing special purpose vehicles. For entry into this specialty, normal color vision according to AFI 48-123, Medical Examination, and Standards, is mandatory.